← How to convert pxl to postscript via command line? When you convert web page to PDF, you may need to set PDF producer. Under such circumstances, you can consider using the VeryPDF HTML Converter command line application to help you solve the problem. VeryPDF HTML Converter has two versions: the GUI (Graphical User Interface) version and the command line version. Compared with the GUI version, the command line version can save more time. The VeryPDF HTML Converter command line version only requires four steps to set PDF producer and convert web page to PDF. But at first you should install this application in your computer. Please download it by clicking VeryPDF HTML Converter Command Line. You are allowed to use it free for 50 times. If you want to buy it, please click Purchase. 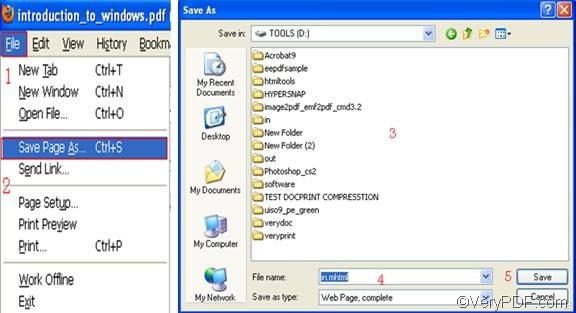 The following will show you how to take four steps to set PDF producer and convert web page to PDF via command line. If you are viewing a web page and want to convert the web page to PDF file, you can first save the web page as a format like HTML. For instance, if you are using Firefox to view the web page, you can do as follows: Click the “File” on the tool bar; > select “Save Page As” from the menu; > When the “Save as” dialog box pops out, you can select a directory in the list box; > enter the full file name, including the file extension like HTML in the as “File name”. > Click “Save” to save the web page on your computer. In this article, we save the web page on disk D and named it in.html. The command line you are going to type in the command prompt window should be composed of four essential items. Moreover, the items must be typed in order with a space between each other. The mentioned items are the directory of the executable file, the command which can be set PDF producer, the directory of the input file and the directory of the output file. The command for PDF producer setting is -producer <string>. The angle brackets are often used to enclose essential contents. string refers to character string, which is always enclosed by quotation marks “” when appears in a command line. The following is an example of command line that can be used to set PDF producer as “pdf producer” and convert MHTML to PDF. You can replace all the directories and the character string in the command, according to your priorities. -producer "pdf producer" ---- the command that can be used to set "pdf producer" (without quotation marks) as the new created PDF’s producer. D:\in.html ---- represents the web page which has been saved as the format HTML and named in on disk D.
When you press “Enter” on the keyboard, the computer will begin to convert web page to PDF and set PDF producer right off. When “result =OK” displayed in the command prompt window, that means the computer has accomplished conversion. Then you can find the producer information by right clicking the icon of the result PDF file. >Then, select “properties” from the drop down menu to open the “Properties” dialog box.>Click the tab “PDF” in the dialog box and you can find the PDF Producer information in the middle. How to set the margin and convert MHT to PDF? This entry was posted in HTML Converter (htmltools) and tagged command line, convert web page to PDF, PDF Producer, set pdf producer, web page to PDF. Bookmark the permalink.